On Friday, party delegates passed a motion preventing it from serving as junior coalition partner to either of the two dominant right-wing parties in the 26-County state -- Taoiseach Enda Kenny’s Fine Gael or Micheal Martin’s Fianna Fail. No party is expected to secure enough votes to rule alone. The motion did not mention the state’s fourth most popular party, Joan Burton’s Labour Party, which has plummeted to just 6 percent in polls after supporting Fine Gael’s austerity policies in the current coalition government. Sinn Fein deputy leader Mary Lou McDonald has previously been dismissive of any pact with the centre-left party, saying that her party has “no interest” in joining with Labour “in its current frame of mind”. A combination of independents and small left-wing parties, although lacking any coherence, therefore remains the only potential government partners for Sinn Fein following the next election, which must be held by Spring 2016. Eoin O Broin, a Dublin Mid-West TD spoke strongly in favour of the motion last night [Friday night]. “For the first time in generations we have the opportunity to break the Fianna Fail - Fine Gael stranglehold on southern politics,” he said. He said a “two tier economy and society” perpetuated by the two parties which arose out of Ireland’s civil war almost 100 years ago, can be replaced with “an Ireland of equals, a united Ireland, a better fairer Ireland. The party’s finance spokesman Pearse Doherty said the current government had been “drunk on power” after it “picked up the Fianna Fail playbook”. “For over 90 years, Fianna Fail, Fine Gael and Labour have failed in government...So we have no interest in propping up failed parties for the benefit of ministerial position. That is what the Labour Party is for,” he said. Mr Doherty said politicians from other parties judged their success by the size of their pension pots, but that was not the Sinn Fein way. The motion, which was passed by a clear majority, could still be overturned through a special Ard Fheis, but that appears an unlikely manoeuvre for now. One new policy voted in by the Ard Fheis calls for the party to show the national flag “due respect”. The decision means party activists will be required to use the Irish tricolour only in formal situations, with impromptu flag waving at election victories being particularly frowned upon. 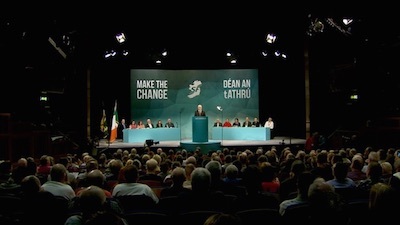 “This ard fheis proposes that our national flag should be shown due respect and not be thrown around by the party’s elected representatives and their supporters,” the motion stated. Speaking ahead of the vote, Sinn Fein deputy leader Mary Lou McDonald said she supported the motion. “The national colours are not the possession of Sinn Fein”, she said. A separate motion, to oppose the invitation of British royalty to the 1916 centenary celebrations, passed as expected despite a few delegates surprisingly speaking out against it. Sinn Fein said up to 2,000 visitors were expected to come to Derry over the weekend for the conference and eight fringe meetings. Main speaker for Friday evening was the Sinn Fein Deputy First Minister and Derry native Martin McGuinness, who described the city and party as “buzzing”. He particularly welcomed the decision of local loyalist bandsmen to accept an invitation to attend a fringe event at this year’s Ard Fheis. In introductory remarks to his keynote speech, he referred to the interest expressed by visitors to walk around the old city walls of Derry. He pointed out that his now deceased mother had never walked around those walls, which were for decades a location of British military infrastructure and loyalist intimidation. His speech focussed on public criticism of his handling of recent talks at Stormont, where a range of austerity cuts for the Six Counties were agreed at the insistence of British Prime Minister David Cameron. As a result, public service unions have warned of impending strike action over job losses and other cutbacks in the education and health sectors. Defending his approach, he said the austerity measures had been “beyond our control”. But he said the recent Stormont House Agreement, which includes grants and loan-raising facilities to help offset the effects of welfare reductions and other cutbacks for the next four years, had “defended the most vulnerable”. “Let our opponents in the north and the south reflect on these very real achievements when, in their desperation, they attempt to blame us for Tory cuts which are beyond our control,” he said. “The fact is, we have protected the vulnerable and the sick, we have protected health and we have defended the education of our children in the face of a massive attack by the British conservative-led government. “North and south we have opposed austerity. In government and in opposition we have opposed austerity. Gerry Adams’s party leader’s address will be delivered at 8.30pm today and will be published here in full.